We’d love your help. 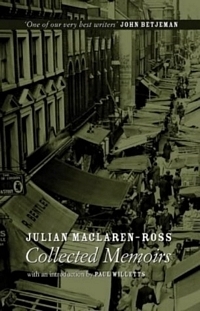 Let us know what’s wrong with this preview of Collected Memoirs by Julian Maclaren-Ross. Julian Maclaren-Ross, with his carnation and silver-topped cane, his fur coat and dark glasses, was a natural bohemian and one of the most colourful inhabitants and chroniclers of the Soho and Fitzrovia of the forties, fifties and sixties. He knew and wrote about its most memorable characters including Dylan Thomas, Graham Greene, Cyril Connolly, Tambimuttu, Nina Hamnett a Julian Maclaren-Ross, with his carnation and silver-topped cane, his fur coat and dark glasses, was a natural bohemian and one of the most colourful inhabitants and chroniclers of the Soho and Fitzrovia of the forties, fifties and sixties. He knew and wrote about its most memorable characters including Dylan Thomas, Graham Greene, Cyril Connolly, Tambimuttu, Nina Hamnett and Woodrow Wyatt. He was something of a dandy and a gifted raconteur, and his life, often chaotic, and related unsentimentally by him in these memoirs, veered between the fringes of the literary establishment and occasional homelessness. Evoking a demolished era of incendiary bombs and rationing, Maclaren-Ross misses none of it and provides an anecdotal history of the place that, between the bombs, offered writers and artists a home away from home. To ask other readers questions about Collected Memoirs, please sign up. Sharp and well written; Maclaren-Ross recollects his memories of Soho in the 1940s and throws in half a dozen short stories at the end. He is pretty much forgotten now; although his only novel “Of Love and Hunger” and his short stories are a little known in bookish circles. He was a celebrated raconteur, well known in the local pubs and clubs where he held court. His biographer Paul Willets describes his perorations around the edge of poverty and mental ill health. He moved continually to avoid Sharp and well written; Maclaren-Ross recollects his memories of Soho in the 1940s and throws in half a dozen short stories at the end. He is pretty much forgotten now; although his only novel “Of Love and Hunger” and his short stories are a little known in bookish circles. He was a celebrated raconteur, well known in the local pubs and clubs where he held court. His biographer Paul Willets describes his perorations around the edge of poverty and mental ill health. He moved continually to avoid creditors and landlords. Alcohol and drugs were a major influence and contributed to his early death. He was memorably the model for X Trapnel in Powell’s Dance to the Music of Time series of novels. Willets comments that Maclaren-Ross makes Kerouac and Bukowski seem like “models of stability and self-restraint” in comparison. Yet no one doubts that he could write; his admirers included Cyril Connolly, Waugh, Powell, Lucien Freud and Dylan Thomas. This is a mirror on a world long gone with insights into figures like Dylan Thomas, the marvellous and incredible Tambimuttu and various assorted artists (John Minton, Gerald Wilde, Macbryde and Colquhoun). However Maclaren-Ross is at his best when he is writing about his time in the army. He spent time in the army in the early 1940s, staying in England, and he brilliantly captures the atmosphere of the barracks and the life of the common soldier. The petty power struggles, idiotic officers, meaningless regulations and the variety of characters thrown together and mostly bored. The memoirs are good; the short stories a mixed bag. The army stories are excellent and he also has a go at Empire in “A Bit of a Smash in Madras”, which captures very well the attitudes of middle ranking colonial staff (as did Orwell in Burmese Days). Maclaren-Ross is a good writer, who wrote in a broad arena; novel, reviews, journalism, radio plays, magazines and primarily short stories. He was very talented and sadly wasted much of that talent. He is still worth reading though. Nevertheless Maclaren-Ross is an excellent writer who captured the mood and people of London Soho life in gritty and fantastic detail. Some of the pieces in this book are not as good as the others, so some parts are uneven, but still, the good parts are really great. Another winner from Julian Maclaren-Ross. I'd previously read his novel 'Of Love and Hunger' and, prior to that, Paul Willetts's biography 'Fear and Loathing in Fitzrovia'. His was a hand to mouth existence, and - for anyone interested in the 1940s, and literary London - this biography is well worth reading. This is probably not the ideal entry point. I'd recommend 'Of Love and Hunger' first, and then Paul Willetts' biography, by which time you'll be hooked and quite possibly do what I did, which Another winner from Julian Maclaren-Ross. This is probably not the ideal entry point. I'd recommend 'Of Love and Hunger' first, and then Paul Willetts' biography, by which time you'll be hooked and quite possibly do what I did, which is go online and buy every title you can lay your hands on. Alas, there's precious few of them. The English writer and dandy, Julian Maclaren-Ross (1912-64), is synonymous with the bohemian world of mid-twentieth-century Soho. There he rubbed shoulders with the likes of Dylan Thomas, Quentin Crisp, John Minton, Nina Hamnett, Joan Wyndham, Aleister Crowley, John Deakin, Augustus John, Robert Colquhoun and Robert MacBryde. His theatrical dress sense — a sharp suit combined with his famous tedd The English writer and dandy, Julian Maclaren-Ross (1912-64), is synonymous with the bohemian world of mid-twentieth-century Soho. There he rubbed shoulders with the likes of Dylan Thomas, Quentin Crisp, John Minton, Nina Hamnett, Joan Wyndham, Aleister Crowley, John Deakin, Augustus John, Robert Colquhoun and Robert MacBryde. His theatrical dress sense — a sharp suit combined with his famous teddy-bear coat, aviator-style dark glasses and cigarette-holder — ensured that he stood out even in such flamboyant company. Intrigued by his stylish get-up and dissolute way of life, numerous writers, most notably Anthony Powell and Olivia Manning, used him as a model for characters in their fiction. During the 1940s Maclaren-Ross was usually to be found in the Saloon Bar of the Wheatsheaf Pub on Rathbone Place, From the late 1930s until the late 1950s, this took over from the nearby Fitzroy Tavern as the most fashionable of the many watering-holes in North Soho, an area that has since become known as ‘Fitzrovia’. Besides being one of Soho’s most famous denizens, Maclaren-Ross was the writer most responsible for defining its sleazy allure. He did so through a string of witty and influential short stories as well as his classic Memoirs of the Forties which also features memorable portraits of Graham Greene and Dylan Thomas. His work was admired by Evelyn Waugh, John Betjeman, Elizabeth Bowen, Graham Greene, Cyril Connolly, Anthony Powell, Olivia Manning, John Lehmann, Lucian Freud and others. Since his premature death at the age of only fifty-two, he has become a cult favourite among fellow writers such as Harold Pinter, Michael Holroyd, John King, Iain Sinclair, Jonathan Meades, Chris Petit, D.J. Taylor and Virginia Ironside. His reputation has also been kept alive through the campaigning of groups such as the Lost Club and the Sohemian Society.